Terrorist groups in Afghanistan, predominantly the Taliban, have reached the “highest level” of “control or influence” of the country’s districts despite the unprecedented airstrike campaign launched against jihadists under U.S. President Donald Trump, an American watchdog agency revealed in an assessment of the conflict released Tuesday. 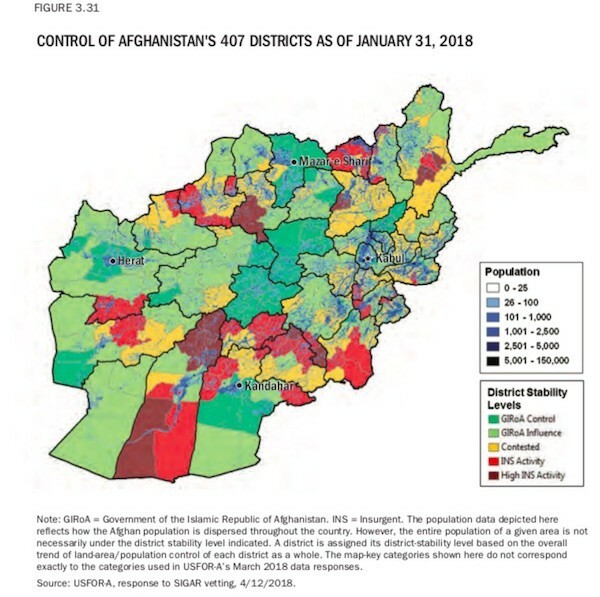 “The Afghan government’s control of districts is at its second lowest level, and the insurgency’s at its highest level, since SIGAR began receiving district control data in November 2015,” the U.S. Inspector General for Afghanistan Reconstruction (SIGAR) reveals in its latest quarterly report to Congress. Citing independent and U.S. government data, Breitbart News determined in February that the Taliban’s strength and power had reached unprecedented levels when compared to all other periods since the start of the Afghan war in October 2001. Still, SIGAR noted that Kabul “made some modest improvements to its control of districts, population, and land area” this quarter (November 1, 2017, to January 31, 2018). Both the Taliban and the Afghan government gained control of territory that the watchdog agency had deemed to be contested as of the end of October 2017. The Afghan government’s influence is concentrated in the highly-populated urban areas. As of January 31, 2018, roughly 65% of the population (21.2 million of an estimated 32.5 million total) lived in areas under Afghan government control or influence, up one percentage point since last quarter. The insurgency continued to control or influence areas where 12% of the population lived (3.9 million people), unchanged from last quarter, while the population living in contested areas (7.4 million people) decreased to roughly 23%, about a one percentage-point decline since last quarter. John Sopko, the SIGAR chief, points out that predominantly Taliban jihadi groups contest the remaining 119 districts (29.2 percent). 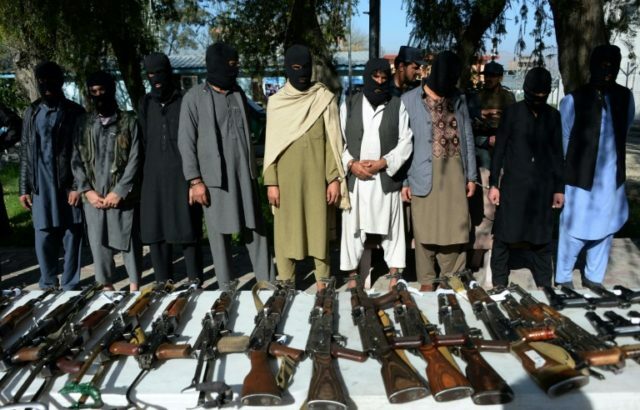 That means the Taliban controls/influences or contests 43.7 percent of the districts in Afghanistan, a slight increase from the group’s position as of October 2017 when the jihadists controlled or contested about 43.3 percent of the country. Last month, the Taliban announced its spring offensive, rejecting Afghan President Ashraf Ghani’s unprecedented peace offer and vowing to kill and capture U.S. troops. Ghani offered a ceasefire and to recognize the group as a legitimate political organization in February, but the Taliban rejected the offer, insisting on a complete withdrawal of U.S.-led international forces before engaging in peace negotiations. When measuring sheer control of the land area (square kilometers), Kabul controls about 59 percent (644,0000) while the Taliban controls or contests the remaining 41 percent (261,000). Taking together, the Afghan government controls about 60 percent of the districts, population, and land area while the Taliban controls or contests the rest. USFOR-A [U.S. Forces-Afghanistan] identified the provinces with the largest percentage of insurgent-controlled or influenced districts as Uruzgan Province, with four of its six districts under insurgent control or influence, Kunduz Province (five of seven districts), and Helmand Province (nine of 14 districts), all unchanged since last quarter. USFOR-A noted again that the provincial centers of all of Afghanistan’s provinces are under Afghan government control or influence. The increase in the Taliban’s control and influence came amid an unprecedented air campaign against jihadists groups in Afghanistan launched under U.S. President Donald Trump. According to the latest U.S. military figures, American troops in Afghanistan have dropped more bombs (1,186) on terrorists in Afghanistan in the first three months of this year than during the same period in 2011, considered the peak of the nearly 17-year-old war that started in October 2001. “The U.S.-led coalition in Afghanistan dropped more bombs during the first quarter of 2018 than it has in the same period in any of the last 15 years, according to Pentagon data,” Voice of America (VOA) reported last month. “The increased bombing is the latest evidence the 17-year-old war in Afghanistan is significantly intensifying since U.S. President Donald Trump announced his new military strategy for the country in August,” it added.